Take a bowl and add green gram into it. Add water to green gram and wash well. Add fresh water to the washed green gram and soak it for an hour. After soaking for one hour, check the gram by pressing with nail, if it breaks easily it indicates that the gram has soaked well. Place a strainer in a bowl and add the soaked green gram and drain out water by shaking the strainer. Offer this prepared Vadapappu to Lord Rama and have it as Prasadam. Spread a cloth and add the drained green gram on it. Spread the soaked gram evenly in single layer on the cloth to remove excess water---the cloth absorbs all the water. Take this green gram into a bowl. Take a raw mango and wash it well. Peel the raw mango and grate it using a small holed grater. Press between fingers and remove juice of grated mango. Add this tangy juice to the dal prepared that day to add extra taste. Take 3tsps of juice extracted grated mango and keep it aside. 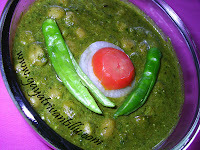 To the soaked and dried green gram add grated coconut, juice extracted grated mango, salt and red chili powder. Mix all the ingredients with fingers to get mixed well. 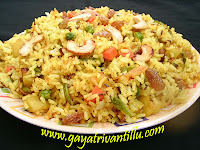 Offer this prepared vadapappu to Lord Rama and have it as prasadam. Grind the ingredients coarsely and make chutney and serve as a side dish with hot rice. Grind the ingredients mentioned above with water and make tasty pesarattlu. 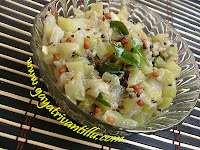 Prepare vadapappu the way mentioned above and do not forget to serve this with Panakam. Using a mortar and pestle make coarse powder of cardamom and black pepper. Take a deep jug and add water. Then add grated jaggery and the prepared spice powder. Mix all the ingredients till jaggery dissolves fully in water. Offer the prepared panakam with vadapappu to Lord Rama and have it as prasadam. Vadapappu tastes good even it is bland without any spices---small children would never complain about its taste. However to make it tasty and spicy follow the method mentioned above. The ingredients added to spice up the soaked green gram are purely to taste—so add accordingly and serve. Removing juice from raw mango is necessary as the tanginess in the juice requires more of other things to balance it. Extracting juice reduces the tanginess—however do not throw away the juice---use it in any dal preparation to enhance its flavor. Also the moisture in the raw mango makes the vadapappu watery---this is another reason to use juice extracted grated mango. Mix the vadapappu ingredients with fingers than using a spoon, to get the flavors evenly mixed. The ingredients added to water in Panakam are to taste ---so adjust accordingly. Some even add dry ginger powder to panakam and it is a personal choice. While making powder of cardamom, do not throw away its skin---add that also to the panakam. While serving it enhances the look of the drink. Panakam is a good thirst quencher and also gives energy instantly as jaggery is added in it. Black pepper balances the sweetness of jaggery and cardamom enhances the flavor of the drink. Adding more of jaggery, black pepper and cardamom spoils the taste as they are added just to give flavor. Serve vadapappu and panakam on the festive day of Sri Ramanavami to all your near and dear. 36 Recipes you may also like to watch.